15 oz. scrimless, matte blockout banner material. 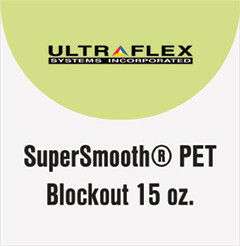 Has a no curl formula giving it a lay-flat appearance without having to use hemming tapes. The blockout layer is made of matted PET, which allows for easier separation during the recycling process. It is best suited for double sided signs and banners that hang or are installed in banner stands.